The term “superfoods” is sort of a silly term simply because ALL real foods have health benefits. We all need a diet filled with a literal rainbow of produce and more to keep ourselves healthy. But there are whole foods that are, to some extent, more nutrient dense than other. So I came up with this list of 50 clean eating super foods that I thought were truly awesome. If you find yourself falling into a “clean eating rut”, this list can be a fun and healthy way to shake things up a bit. It’s a great reminder of the types of foods we should be including in our eating plans and makes one heckofa healthy shopping list to boot! Enjoy these foods in season for optimal nutrient content and try to purchase organics where you can afford them. Please note, none of the following information is intended as medical advice. Please consult your doctor if you have medical concerns. APPLES – Apples are fantastic for your heart as well as for keeping your bowl movements regular. And lets face it. If things are “moving” along smoothly, many diseases are far less likely to occur. APRICOTS – These orangey little fruits are a health inducing powerhouse! Apricots help fight cancer, control blood pressure, slows the aging process and even fights against Alzheimer’s! ARTICHOKES – While it can be tough to eat these without drenching them in butter or mayo, these fabulous flower buds actually lower cholesterol, aid your digestions and even fight liver disease. ASPARAGUS – These green “sticks” of deliciousness are wonderful for fiber intake as well as for vitamins A,C and E. They have many minerals and are great for your blood sugar. AVOCADOS – These small, oval fruits taste great in many different dishes, they also help fight diabetes and high cholesterol. Avocados can actually help stop a stroke dead in its tracks, and to top it all off, your skin will look better as well! BANANAS – Bananas can “plug you up” when you’re sick or have “the runs”, they can sooth a nagging cough and help keep your blood pressure regulated. Pretty good for this yellow yummy! BEETS – Most folks either loves these red root veggies, or absolutely hate there. There’s very little in between. But if you love em’, you’ll have a great leg up on those that don’t. Beets help with blood pressure control, weight loss and even helps keep your bones in good condition! BLUEBERRIES – These lovely little berries pack a truly big nutritional punch! They are credited with fighting cancer, strengthening memory and even helping your heart and blood sugar. You definitely want to include these goodies in your clean eating plan! BROCCOLI – These little “trees” can help strengthen your bones, fight cancer and even preserves your eyesight! BRUSSEL SPROUTS – Love them or hate them, these “little cabbages” are filled with fiber, antioxidants and have been said to help fight cancer. CABBAGE – For those of you who love your cabbage, you can boast about the extra health benefits you’re getting. Benefits such as help with weight loss, cancer prevention and heart health. CANTALOUPE – Cut into one of these lovely melons to help build your immune system and fight cancer, high blood pressure and even high cholesterol. CARROTS – We all grew up knowing you have to eat your carrots to have healthy eyes. Well guess what? The same applies to adults! But that’s not all you get out of eating your carrots. You also get smoother bowl movements, weight loss, better heart health and a lowered risk of cancer! CAULIFLOWER – This one is great for the guys! Cauliflower helps fight prostate cancer and builds bone strength. But you women can love it too. It fights breast cancer (which men can get too!) and even helps bruises heal faster. CHERRIES – Cherry season is just a few months out of the year, so you should indulge while you can! Cherries have been credited with helping to preserve your brain and heart health. They may even slow down the aging process and give you a helping hand with insomnia! CHIA SEEDS – These high protein seeds are also high in omega-3 fatty acids, as well as fiber and antioxidants. CRANBERRIES – These little red treats are not only delicious, but are also said to help with urinary tract infection, fight cancer and lower blood pressure. Not bad for a little berry! DARK CHOCOLATE – Whoever said chocolate was bad for you wasn’t talking about dark chocolate. This devine deliciousness seems to help with cancer, cardiovascular health, and possibly even premature aging! EGGS – These affordable protein sources are high in B vitamins as well as vitamin D and certain minerals such as zinc and iron. FISH – While all varieties of fish will have different levels of nutrients, in general, most fish is a good source of omega-3 fatty acids as well as certain vitamins and minerals such as vitamin D, potassium and calcium. FLAX – You can’t go wrong with flaxseed. It aids in digestions, helps your immune system and possibly even with blood sugar levels in diabetics. The only thing way to top the benefits of flaxseed are with chia seed.. But flax is more widely available than Chia and often more affordable. GRAPES – Enjoyed as a sweet snack or even dessert, these fruits are filled with helpful nutrients thought to fight cancer, improve heart health and blood pressure. GREEK YOGURT – A good source of vitamin B12, calcium and potassium, Greek yogurt is said to aid in digestive health due to the probiotics. It’s also a decent source of protein. GREEN TEA – An ancient remedy for hundreds of years, 1 cup a day is said to help fight cancer, help with weight loss and help fight strokes. KALE – This higher protein green is also a great source of fiber, vitamin C, A and K as well as folate. It also contains omega-3 fatty acids. No wonder people are obsessed with kale! KIWI – High in vitamins such as K, C and E, you’ll also get a healthy dose of antioxidants and potassium from these delicious fruits. LEMONS – These sour fruits are amazing at so many things. Fighting everything from cancer to the common cold, never miss a chance to include these in your eating plan. MANGOS – This tropical delight helps strengthen your memory as well as your digestion. It also fights cancer and Alzheimer’s disease. MUSHROOMS – The lowly mushroom deserves a pedestal for its medicinal uses. It helps control blood pressure and lowers your cholesterol. And yes, like many other foods on this list, mushrooms fight cancer too! NUTS – Though all nuts have different levels of nutrients, in general, nuts will give you healthy doses of unsaturated fats, vitamin E and omega-3 fatty acids. OATS – Oats are well-known for their cholesterol lowering abilities. But did you know they also improve the condition of your skin and help fight diabetes? OLIVE OIL – Olive oil should be a part of many dishes you cook. It strengthens the heart, fights diabetes and cancer and helps with weight loss. For those with dry skin, it’s an excellent way to cleanse your skin as well! Just put a little on a cotton ball and wipe clean. You’ll never use cleansers and water again! ORANGES – We all know that a nice glass of OJ goes well with just about any breakfast. But did you know that oranges strengthen your immune system, fight cancer and strengthen your heart? PAPAYA – This tropical fruit has been attributed many health benefits from helping with weight loss to easing menstrual cramps. They are said to help boost your immunity, aid in good blood sugar control and even help with arthritis. PEACHES – These summer time treats are great for digestion and constipation. PINEAPPLE – Never miss a chance to eat pineapple! Not only is it absolutely delicious on a hot summer day, it also strengthens your digestion, your bones and aids with weight loss. PUMPKIN – Some folks see pumpkins as something to carve once a year. But the truth is, your friendly Jack-O-Lantern also provides tons of fiber, controls blood pressure and normalizes heart function. So this year, carve your pumpkin a few hours before dark, and then bring it in for cooking when the festivities are finished. POMEGRANATES – These amazing fruits have up to 7 times the amount of antioxidants of green tea! Impressed? They also fight cancer, and reduce blood pressure and bad cholesterol. QUINOA – Actually a seed, this “grain” is the only grain on the planet that contains all 9 amino acids. A complete protein! RICE (BROWN) – Brown rice should be a staple in every one’s diet. Not only is it a very low allergen food, it also protects your heart and fight diabetes, kidney stones and cancer. SALMON, WILD – Wild salmon provides oodles of omega-3 essential fatty acids. A crucial bit of nutrition for us humans. But that’s not all. Salmon also provides many other vitamins like vitamin B3 and B12 which contribute to a healthy metabolism. SPINACH – Popeye had the right idea. You have to eat your spinach to grow strong! Why? Spinach helps you fight cancer, improves your cardiovascular health and improves brain function! SWEET POTATOES – All clean eaters know, sweet potatoes are a fantastic carb to include in your clean eating plan! But why? Because they protect your vision, encourage a good mood, fight cancer and keep your bones strong. That’s why! TOMATOES – These fabulous orbs are big time cancer fighters! They also help battle high cholesterol. WATERMELON – This wonderful summer time treat is a fabulous aid for weight loss, lowering cholesterol, avoiding strokes and controlling your blood pressure. So eat up! WHEAT GERM – The healthiest “germ” you’ll ever include in your diet! It fights colon cancer, keeps things “moving smoothly” and helps your digestion in a big way. WINTER SQUASH – As a general application, winter squashes offer up help with strengthening your immune system with lots of fiber and vitamins such as B6 and 3, omega-3 fatty acid, potassium and vitamins C and A. A good way to stay healthy in winter! Ashley – You’re welcome! Enjoy! Oh gosh! Thank you so much for posting this! I was relieved to see many foods, I currently eat, on the list, but there is always room for improvement! I am printing this out and making sure these foods are incorporated in future meals plans. Deb – Fantastic!! I’m so happy you found this list helpful! Thanks for the great list. It reminds me of one of the books that first started me toward eating clean — Gillian McKeith’s “You Are What You Eat.” I love her concept of a “diet of abundance” — instead of talking about what NOT to eat, she talks about the many wonderful things we SHOULD eat — and lots of them, if we wish! — to stay healthy and, as a matter of course, slim down. P.S. I see you reached a Golden Anniversary on your weight loss. What an amazing achievement. Congratulations. Carolyn – I’ve never heard of that book. I’ll have to check it out! Thanks so much! Christine – Fabulous! I can’t wait till our farmers market starts back up for the season! Excellent guide… and thanks for sharing it! Guto – Ooooh! That DOES sound good! Paulissa – You’re welcome! I’m so happy you found it useful! Thanks for this – I love everything on here !! Scarlett – And you’ll be healthier for it too! How about dipping the artichokes in guacamole? Or olive oil seasoned with some fresh minced herbs? There are lots of ways to mix these wonderful foods together. I’ve recently planted 5 apple trees, 2 peach trees, an apricot and a pear tree, 4 bluberry bushes and 3 cranberry plants. I have red and gold rasperries, blackberries and marionberries still to plant. Then the salad greens, onions, radishes and more in my salad garden. The garlic I planted las fall looks great, too. Jodi – Wow. I’m impressed! My garden pales in comparison! Go girl! Oh my goodness, I hope you know how to can and preserve! Alicia – Yes!! Quinoa is fabulous! Thanks for the reminder! I’m nowhere going to start clean eating because I’d prob go crazy BUT! I love all your recipes! especially your smoothie ones. I do smoothies as snacks and breakfasts sometimes and let me tell you something, one of my favorite smoothies is green tea, blueberries, banana and chopped up spinach with a bit of honey. They really fill you up! Ven – That’s wonderful! What a terrific weight loss! I have to say though, it does sound like you are eating clean from your description. Either way, you’re doing great!! Keep up the wonderful work, and thanks for trying my recipes! What a great list! Your website is such a wonderful resource for me! So THANK YOU! HW – You’re welcome! Enjoy! Casey – No worries. I was new and confused myself once. Cheese is okay in small amounts and on occasion. Not for daily consumption because the fat content is too high. That said, if you have it, have the real stuff. Not the non-fat, rubbery versions which are definitely not clean. Greek yogurt is great so long as you buy the plain stuff and flavor/sweeten it yourself with clean additions. I haven’t looked, but I doubt the flavored ones in the stores are clean. I shop pretty exclusively at Trader Joe’s and Costco, with occasional stops at Whole Foods. So I can recommend the brands that I buy, but there’s no guarantee you’ll find them in your area. Jaiya – Hahaha!! I’m so glad I’m not the only person who loves pictures of blueberries!! I just think they are so pretty. You can’t help but smile! Julie – I’ll eat a piece to that!!! Snowpea – Yes, almonds are wonderful. Are you on Pinterest? I would love to display this on my “Healthy Ideas” board! Rainbowmemaw – Yes I am. If you go to my web site, you’ll see the Pinterest button on the right. ttemple5 – Meat isn’t really a super food. Eggs and salmon are sometimes included on some lists, but it’s pretty rare that meats are on a list of super foods. Thank you for all your time, research, passion and generosity. Very appreciative of this information and the conciseness with which you have shared it! YRM – Berries in general are wonderful. But some have more nutrients than others. That does not mean that the others are not healthy, it just means that some have more nutrients and are therefore considered a super food. Almonds are good, but walnuts are better. This is not an all inclusive list, but it’s a good start. I cannot eat avocadoes on their own but they taste great with a bit of lemon on them. shape for Women”, trying to make BIG changes in my eating habits. Now that I have you in my favorites…, I am one more step closer to my goals!! Thanks for making the food list. Love your blog!!! 🙂 Amazing detail and such great advice!!! Just a question – does peppermint tea count as ‘green’ tea? I <3 peppermint tea!!!!…. No. Green tea is a particular type of tea. Different from peppermint both in type and flavor. But there’s nothing wrong with peppermint. Thanks!!! I’ll compromise and have a cup of both each day!! 🙂 win/win!!! 🙂 Thanks for your prompt reply!! Do you have any clean favorites for putting on top/mixing into plain yogurt to make it taste a little better? A bit of fruit, nuts and a touch of honey. This list is awesome! I have been using the Nutribullet and absolutely loving it to pieces!!!!!!!!!! It’s so worth the $100 and you can add many of these superfoods to your daily nutriblast and you don’t even know you are eating healthy :). 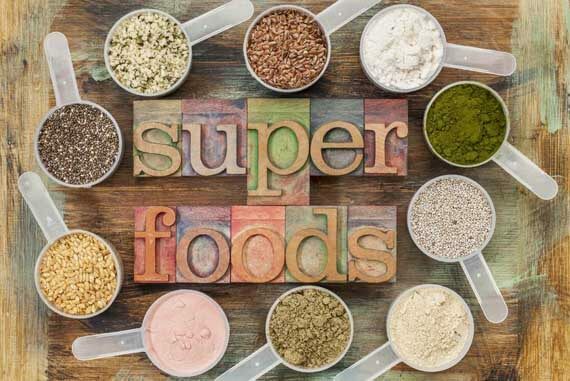 The superfoods you mentioned here are all on the infomercial too for Nutribullet and they talked about how beneficial they are not only to your body but also your state of mind. Thank you so much for putting this information into 1 place for everyone! This is so helpful and I’ve printed it out and placed it in my Home Binder so I can reference it when grocery shopping and meal planning. Thank you so much!! I hope I see your list again soon. Thank you so much for listing it. For now I will just try and remember some of the foods listed. I guess I’ll just have to print it out and keep it in my cupboard. 🙂 Thanks again. I would like to start eating clean foods in hopes of managing MS and my weight. The list is not avaliable snd I havr no idea where to begin. Can someone provide the previous list until the new one comes out. Imogen – I am reworking each and every one of the food descriptions, so it’s been quite a process. But it will be up again soon. Thank you so much for your time and effort and sharing your knowledge. See I am new to the concept of clean eating, and this post has been going for some time, you have helped so many already. Lucy – I’m not a dietitian, so I can’t say what’s right for you. But I will say that when I started, I always just looked at my plate before I ate to make sure I had a good balance. I filled 1/2 the plate (a small plate, not dinner size) with vegetables, 1/4 with clean grains and a 1/4 with protein. These days, I typically omit the carbs as I find that I get plenty of them from my vegetables. But it all depends one what your body is happiest with. You may want to consider speaking with a registered dietitian. They can help you get far more specific if that’s what you need. I’m confused about chocolate. I see Dark chocolate is on your list (and I am thrilled about that 😉 ) but doesn’t chocolate have sugar in it which we are trying to avoid? WOW! This will be a challenge for me because several of the foods on your list I have never had before. What about coffee and a sweet creamer, can I have that each morning? MeeMa – Coffee yes (in moderation), sweet creamer no. However, I do have several coffee recipes here you might enjoy and even a couple of creamer recipes. Give them a try! You can locate that section in my recipe index under beverages.